© Besse et al; Licensee Bentham Open. 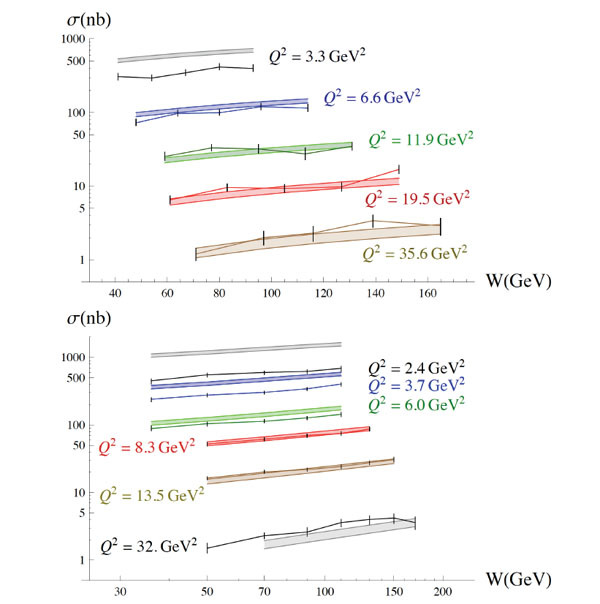 We investigate the longitudinal and transverse polarized cross-sections of the leptoproduction of the ρ meson in the high energy limit. Our model is based on the computation of the impact factor γ*(λγ)→ ρ (λρ) using the twist expansion in the forward limit which is expressed in the impact parameter space. This treatment involves in the final stage the twist 2 and twist 3 distribution amplitudes (DAs) of the ρ meson and the dipole scattering amplitude. Taking models that exist for the DAs and for the dipole cross-section. We get a phenomenological model for the helicity amplitudes. We compare our predictions with HERA data and get a fairly good description for large enough virtualities of the photon. PACS number(s): 13.60.Le, 12.39.St, 12.38.Bx. Keywords: Collinear factorization, leptoproduction of vecteur meson, low x, helicity amplitudes, kT-factorization, polarized cross-sections. Impact factor representation of the helicity amplitudes. Assuming the virtuality of the photon Q (Q2 = -q2) is large compared to the QCD scale ΛQCD, the impact factors LL and TL were computed in ref. , using the collinear factorization on the light-cone. In this approach, the impact factors are parameterized by the leading twist DA of the ρ meson. This computation was extended in refs. [2, 3] to obtain the TT impact factor in the limit |t| ~ 0. In this last case, the leading twist 2 contribution does not exist and the amplitude is parameterized by the twist 3 DAs of the ρ meson. The result for TT obtained from the light-cone collinear factorization is the sum of two contributions: from a quark antiquark (qq) Fock state and from a quark antiquark gluon (qqg) Fock state. Relations between the DAs can be derived from the first principles of QCD and the twist 3 DAs that parameterize the Fourier transforms of the qq correlators can be split into two solutions: the Wandzura-Wilczek (WW) solutions, which consist in neglecting the qqg DAs, and the “genuine” solutions, that only depend on the qqg DAs. Thus, one represent the and the contributions to the impact factor T∗T as a sum of a WW contribution and of a genuine contribution. A first phenomenological model proposed in ref. was based on the results of refs. [1, 3] and used a model for the proton impact factor inspired from ref. . 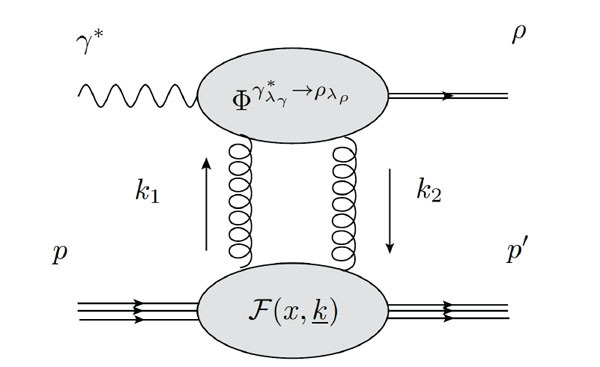 The results of this study have led to the conclusion that the soft t-channel gluons have a sizable contribution, which calls for the implementation of the saturation effects in this perturbative approach. where the functions qqL*L, qqT*T and qqgT*T are respectively our results for the transitions L*qqL, T*qqT and T*qqgT. r,k is the scattering amplitude of a color dipole of transverse size r, with the t-channel gluons having transverse momenta r. In eqs. (5, 6) a and b are the color indices of the t-channel gluons in a singlet state. As a result, the well-known wave functions of the virtual photon factorize out in the expressions of qqL*Land qqT*T . The ρ meson non-perturbative parts are encoded by the twist 2 and twist 3 DAs and µ stands for the factorization/renormalization scale of the DAs. We use the model of Ball, Braun, Koike and Tanaka developed in ref. to get explicit expressions for the DAs. This model relies on the conformal expansion of the DAs to separate the longitudinal momentum dependence from the scale dependence in µ. It is customary to call “asymptotic” (AS) the results in the limit 2. On the other hand, a natural choice for this scale is 2=(Q2+m2)4. Note that the factorization of the dipole scattering amplitude r,k is due to the relations between the DAs coming from the equations of motion of QCD. where x,r is the dipole cross-section. These expressions are the starting point for our phenomenological analysis. In ref. , we have compared our predictions for the transverse and longitudinal polarized cross-sections, shown in Fig. (2), with the data from H1 . These predictions are obtained using the dipole scattering amplitude of ref. , which is based on numerical solutions of the running coupling Balitsky-Kovchegov (rcBK) equation . This model of dipole scattering amplitude allows to account for the saturation effects in our description of the ρ meson leptoproduction. Note that as we use a model of dipole cross-section already fitted on inclusive structure functions then we do not need to adjust value of any parameter. The results are in good agreement with the data for Q2>5 GeV2 and they are weakly dependent on the choice of the factorization/renormalization scale µ. The discrepancy for smaller virtualities Q2>5 GeV2 indicates that higher twist corrections to the impact factors can become important for such values of Q2. Left: Total, WW and AS contributions to σT vs Q2 , compared to H1  data. Right: Total and AS twist 2 contributions to σL vs Q2 compared to H1 data. In Fig. (3), we show our predictions for the total cross-section σ of the diffractive leptoproduction of ρ meson and compared then with the data of H1  and ZEUS , as a function W. The W-dependence of our predictions is given by the dipole cross-section model . In this way we obtain a good agreement between the predictions and the data for the W-dependence. Predictions for the total cross-section σ vs W compared to H1  (left) and ZEUS  (right) data. The success of the model we have presented to describe the W- and the Q2-dependencies with the proper normalizations for large enough Q2, relies on the computations from first principles of the impact factors and the models for the twist 2 and twist 3 DAs as well as the model for the dipole scattering amplitude. Consequently, this approach constitutes a good way to unravel the non-perturbative aspects of the leptoproduction of the ρ meson. The perspectives of this study are numerous, as it could be extended in the non-forward kinematics and for other helicity amplitudes. This could allow to probe the impact parameter dipole/nucleon target dependence of the dipole scattering amplitudes. The higher twist correction effects could lead to a better description of the data for lower values of Q2 closer to the saturation scale in the HERA kinematics. 1 We denote by x the 2-dimension euclidean vector associated to the Minkowskian x,x2=x2. We thank B. Ducloué, K. Golec-Biernat, C. Marquet, S. Munier and B. Pire for interesting discussions and comments on this work. We thank the organizers, the Tel Aviv French ambassy and the French CEA (IPhT and DSM) for support. This work is supported by the P2IO consortium, the Polish Grant NCN No DEC-2011/01/B/ST2/03915, the Joint Research Activity Study of Strongly Interacting Matter (acronym HadronPhysics3, Grant 283286) under the Seventh Framework Programme of the European Community and the French grant ANR PARTONS (ANR-12-MONU-0008-01). Ginzburg IF, Panfil SL, Serbo VG. The possibility of the experimental investigation of the QCD pomeron Nucl Phys B 1987; 284: 685-705. Anikin IV, Ivanov DY, Pire B, Szymanowski L, Wallon S. On the description of exclusive processes beyond the leading twist approximation Phys Lett B 2010; 682: 413-8. Anikin IV, Ivanov DY, Pire B, Szymanowski L, Wallon S. QCD factorization of exclusive processes beyond leading twist gamma*T → rho T impact factor with twist three accuracy Nucl Phys B 2010; 828: 1-68. Gunion JF, Soper DE. Quark counting and hadron size effects for total cross-sections Phys Rev D 1977; 15: 2617-1. Anikin I, Besse A, Yu D, et al. A phenomenological study of helicity amplitudes of high energy exclusive leptoproduction of the rho meson Phys Rev D 2011; 84: 054004-23. Besse A, Szymanowski L, Wallon S. The dipole representation of vector meson electroproduction beyond leading twist Nucl Phys B 2013; 867: 19-60. Ball P, Braun VM, Koike Y, Tanaka K. Higher twist distribution amplitudes of vector mesons in qcd formalism and twist three distributions Nucl Phys B 1998; 529: 323-82. Besse A, Szymanowski L, Wallon S. Saturation effects in exclusive rhoT, rhoL meson electroproduction J High Energy Phys 2013; 1311: 062-108. Aaron FD [H1 Collaboration] et al. Measurement of diffractive scattering of photons with large momentum transfer at HERA J High Energy Phys 2010; 1005: 032-50. Albacete JL, Armesto N, Milhano JG, Quiroga-Arias P, Salgado CA. 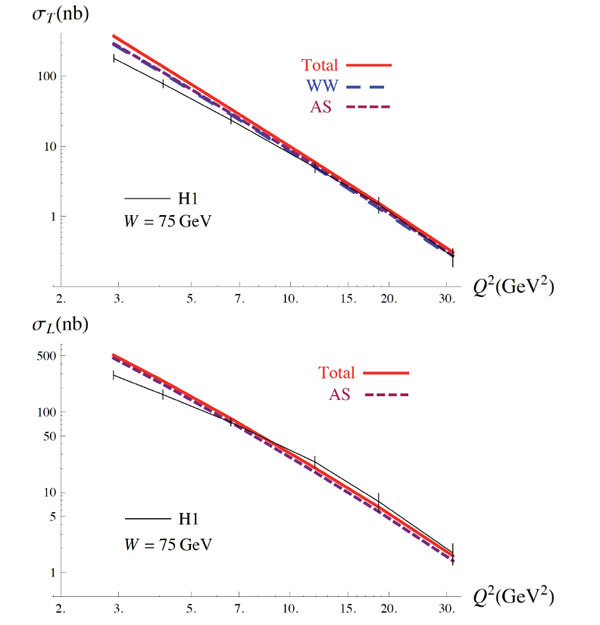 AAMQS A non-linear QCD analysis of new HERA data atsmall-x includingheavy quarks Eur Phys J C 2011; 71: 1705-5. Chekanov S [ZEUS Collaboration], et al. Exclusive ρ° production in deep inelastic scattering at HERA PMC Phys A 2007; 1: 6-52.